Finally, I am doing something with the third of my three current weaving goals: 1. go wider, 2. use finer materials and 3. go longer. I have been working this week on the long warp… the yellow 60/2 silk scarf. After finishing the bands of supplementary-weft patterns at the start which had me sitting in the same spot for days, I am now on to the faster mostly plain-weave part. I slow down every now and then to add a little flower motif with silk supplemental weft. Sometimes, it is a solid flower, like the single flower you can see above, and sometimes an outlined one. This does not have me sitting still for long. There is a regular need to sometimes move forward as I roll up the woven cloth and then move back as I unroll the unwoven warp from the far end. The cushion on which I sit is glued to a polished piece of wood which allows me to dig my heels into the floor and slide myself forward and back as needed. It’s a lot easier than having to get up and push that cushion across the rug or wiggle it forward or back. It also allows me to make finer adjustments while seated. I used sheets of paper to roll the unwoven warp to keep everything neat and even. It’s a lot of fun unrolling the warp from the far end and having one of the sheets of paper drop out…progress! I then use that same sheet of paper between the layers of rolled woven cloth. I don’t know if you ever played ”pass the parcel” as a kid at birthday parties. It reminds me of that. Each time I unroll, it’s like removing one layer of the wrapping on the parcel only to find that there are still more layers underneath. However, I do find there are certain advantages to having the unwoven warp rolled up. I think that it is easier for me to maintain a consistent tension on the warp if I am always seated at more or less the same distance from the end of the loom. 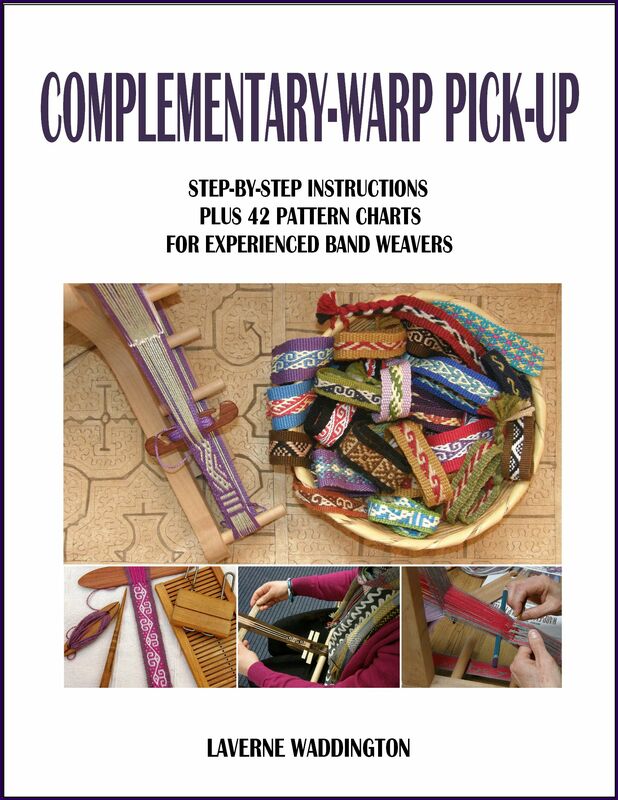 Backstrap weavers who use circular warps are able to do that. They weave around the circle of warp without having to change in any major way their seated position. My teacher, below, can always be seated the same distance from the wall and brace her feet against a wooden block. You can see how her finished woven piece is circular. I can’t resist unrolling my work all the way every now and then to see how it is going and to make sure that the scattered effect of the flower motifs is working. There will be a small celebration when the final piece of paper drops off the end beam and I can see the end of the warp. But, I know that event will mean that soon I will be slowing down to a crawl to duplicate the bands of patterning that I wove at the beginning of the piece. I have managed to be disciplined, not measure, and keep the motifs truly scattered. The cloth is a little on the stiff side now but I know, having worked with this 60/2 silk before in the teal bandana at left, that it will soften beautifully after wet-finishing and pressing. The sheen of the silk will be more obvious then too. The patterns I chose for the bands are loosely based on those I saw on a Mexican rebozo, or shawl. I made quite a few changes to the original to include my own flower motif. My weaving friend, Franco, shared a lovely video of a parade of Mexican rebozos…the variety is astounding and I love the ways the models wear them. There is a white one and a black one there that I am totally in love with! My erratic internet can handle this video and so I am sure that you will all be able to enjoy it….Thanks, Franco! One day I will have a warp for a rebozo on my backstrap loom. While on the topic of length, I guess the longest pieces of warp-faced weaving I have seen are the Central Asian yurt bands. My friend Lisa owns one and hers is 48 feet long….makes my scarf length seem ridiculous! Here it is wrapped around her yurt…how gorgeous! The heddle stick is attached to the tripod which keeps it permanently raised. We saw a similar system being used by a Turkish weaver in a video I shared here recently. The shed rod is a flat piece of wood which is most likely turned on its side when needed. At the weaving line you can also see a small stick holding the warp threads that will float to make the pattern. Here’s another beauty that my friend Yonat and I found in a store in California when we were out and about. We can only imagine how long it is. I got pretty excited the first time I encountered these pieces via my friend Lisa online. 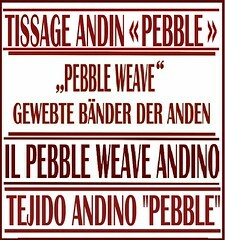 I thought…Wow, the Andean Pebble Weave structure in Central Asia! But, on closer inspection, I could see that it wasn’t the same structure. It is not a complementary-warp structure at all. Complementary-warp weaves have two structurally identical faces. The colors are reversed on the two sides of the cloth as you can see in my piece below. I call the structure that is used to create the yurt bands, Simple Warp Floats…this my dull structural name for it. ”Simple” because the floats appear on only one face. In Kyrgyzstan it is known as terme. You can see how different the two faces look in this picture of a piece I wove replicating some yurt band motifs. The face on the left is the ‘good” face. The face on the right has spaces where the black weft is exposed. You can also see this difference in the first picture of Lisa’s rolled up band above.The same motifs can be easily woven as double-faced ones but they are not woven that way traditionally. …but I’ll never go as long as those yurt bands! It was even more exciting to find that the structure is used here in South America, in the tropical lowlands of Peru, for example. I have seen it on pieces from Iran and Mexico as well. These were inspiration for a set of place mats I wove using this Simple Warp Float structure. It’s all based on a basic warp of two colors. One shed holds all the light threads and one shed all the dark. If woven as plain weave, you would produce a band of dark and light horizontal bars. You could then choose to create three-span floats with certain light threads in order to make a pattern. Or, you could do the same with just the dark threads. Or, you can alternate as seen at right….one motif with dark floats followed by another with light floats The horizontal bars act as a sort of background. 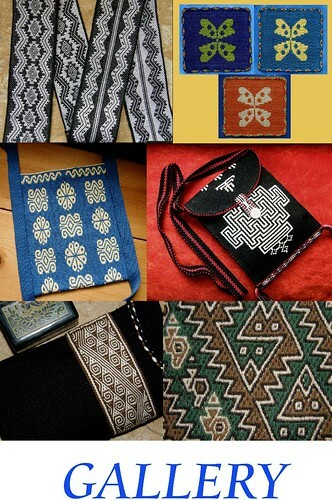 Below, you can see a variety of patterns on a belt from Aguacatan, Guatemala. This is a very long piece for a belt…ten feet. The dark and light floats are sometimes used together within one motif. The horizontal bars, again, act as a sort of background to the motifs. The bars really dominate in this belt. You can also choose to float threads in a way that has the horizontal bars appearing to be part of the design itself rather than just being a ”background”. This is a piece I wove after returning from Ecuador where I had stayed with cotton weavers who use this structure in their work. Only the dark threads are forming floats in this piece and, to me, it feels like the horizontal bars are forming their own pattern of large ‘X’s. And then, you can go all the way and create so many floats with both colors that you completely cover the horizontal bars as in my next example…. This is the terme structure that is used to create the yurt bands I showed. I used it to weave this place mat with a motif from the Peruvian tropical lowlands. You can see a picture of a weaver in Kyrgyzstan (from the Little Foot Yurts site) saving the dark warp threads on a small sword. These are the threads that will float to form the pattern. More information on these structures can be found in my tutorials here, here and here. I will be transferring this information to my Structures and Terminology page soon. I think I was wise to choose a project that included lots of plain weave for my first venture into this kind of length in backstrap weaving. There are times when I am happily zooming along….opening a shed, beating, passing the weft and so on….and only slowing down to weave a little flower, the pattern for which I have by now memorized. I can imagine the time and concentration required to weave those 48-foot long yurt bands with all that pick-up every single step of the way! I wonder how many such bands a weaver in Kyrgyzstan makes in lifetime. Julia T wove the wall hanging at left. It has a mixture of motifs from my books and those of her own. The maze pattern is her own and she has cleverly combined a traditional Andean pattern with her own ideas. The piece recalls time she spent with a team of friends creating a labyrinth in a park surrounded by beautiful bird-laden Australian bush. Julia W’s piece is her adaptation of a Japanese sashiko embroidery sayagata motif to the Andean Pebble Weave structure. The gold twining, hanger and stripes are such lovely touches. She has done several beautiful pieces inspired by Japanese embroidery patterns which she cleverly adapts to Andean Pebble Weave. Both Julias came up with clever ways to hang their pieces. Julia W’s wrapped ring and bamboo stick are beautiful in their simplicity. She has created two very different faces by having not only the pebble weave but also the intermesh borders in reversed colors. This way, the piece can be hung on either a dark or light-colored wall. Julia T wove a stick into the last few inches of her weaving so that she can change the face that is being displayed simply by flipping the end and fringe. That’s the thing with these double-faced structures. You want to be able to enjoy both beautiful faces. And then, there are some bands. Marieke has been working with the double weave technique from this tutorial. I learned it as a two-shed technique which means that it can be easily adapted to the inkle loom on which Marieke prefers to work. 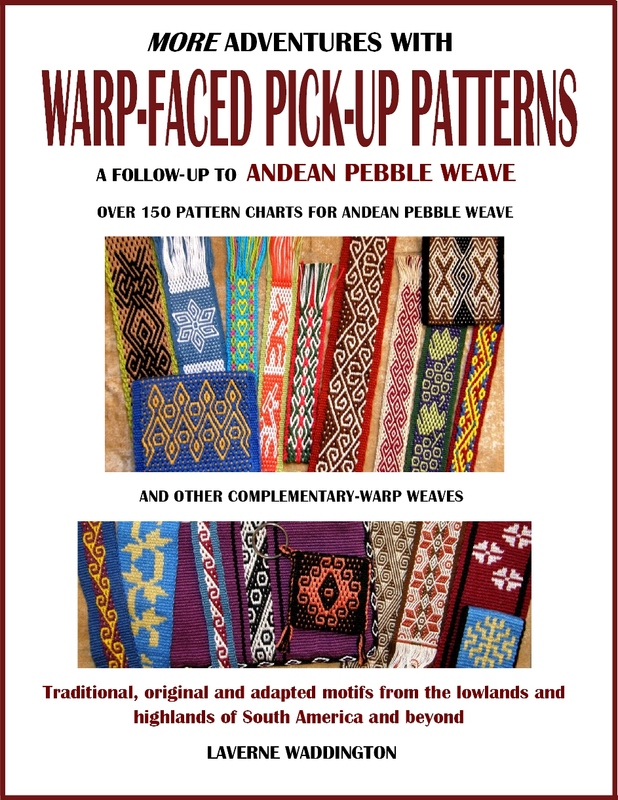 Kathy and I got to weave together a couple of years ago and she continues to enjoy Andean Pebble Weave on a backstrap loom using patterns from my books. I love her jolly ”saver cord” but mostly, I love the fact that she is using one. Not everyone falls in love with it as I have. I could see from my stats that there were an enormous amount of hits on my link to the site with the triangle purse tutorial last week. I hope that many of you go ahead and make one and show me the results. 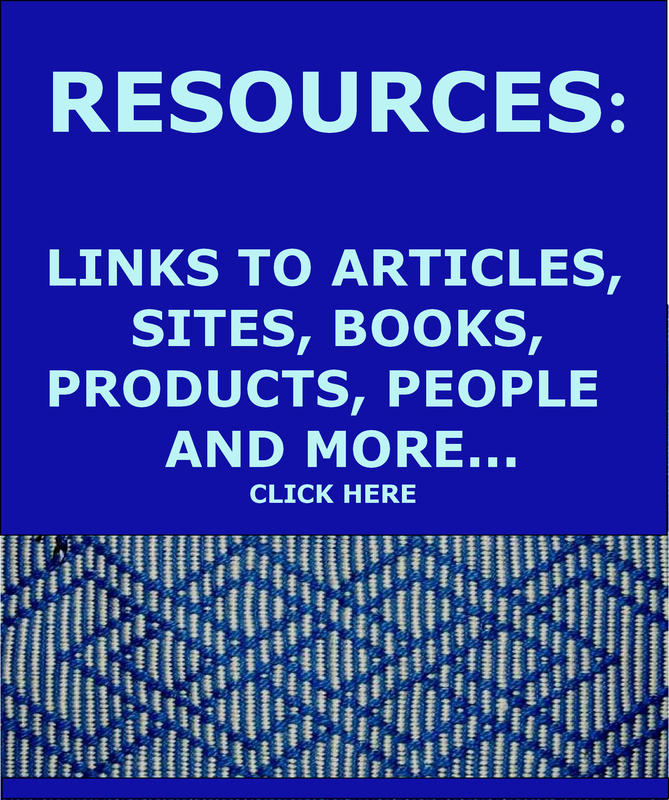 The link to the tutorial along with other goodies can be found on my RESOURCES page. So, it’s back to my long project. I think there are only two more pieces of paper left on my rolled-up warp. I can’t wait to wash and press the piece and feel its liquid slinkiness slide through my hands. Love your silk scarf. It is beautiful. Marvelous! you are becoming a tremendous weaver. Please inlight me: what are this white strips for? it seems they are separating odds and even warps. what for? Thank you! The strips of paper are within each of the two sheds and help me to set the width as well as give me something firm against which to beat when I pass the first shot of weft. They also reserve inches of unwoven warp which will become the fringe. I am so amazed by the length of your yellow silk warp!! It is stunning!! What a piece it will be!The patterning is delightful too. The longest piece of backstrap I have seen was in Malaysia,when I was there a few years ago.The Iban do a Pua cloth which is a beautiful warp ikat on long floor looms. Thanks so much, Frankie. You must have wonderful pictures from your stay in Malaysia and I wonder if you got to see some of the warp ikat process. Thanks, Deanna. And thank you so much for the gift of the silk. the yellow silk project is absolutely stunning, Laverne. I too am excited to see it finished and the silk come alive. Also, I loved the video – there is so much beauty to admire in handwoven garments, it is really humbling. Thanks, Julia. I am twisting fringe this morning and hope to wet finish this afternoon. Glad you enjoyed the video. Oh my goodness Laverne, you never cease to amaze me. That silk warp is just incredible. I don’t know how you do it! Loved the rebozos, too. Thank you so much for sharing it all. Thanks, Sue! Aren’t the rebozos amazing? So much inspiration…where do we start? Your gold piece is gorgeous, I’m so impressed.